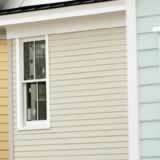 Home | Vinyl Siding Styles | Mastic Vinyl Siding Styles | Want Alcoa siding but cannot find it? Alcoa is a name that has been associated with high quality exterior siding for a very long time--first with aluminum and then with their outstanding vinyl products. The company's siding was a favorite of builders, contractors and homeowners for its realistic wood appearance, ease of installation and low maintenance. However, if you are planning a vinyl siding project and have been searching for Alcoa siding, you are probably not having much luck. The company does not make siding anymore, but don't despair; the characteristics of Alcoa siding that you liked so well are still available. They are just being produced under a different name. Mastic Home Exteriors has been involved in the siding industry since 1932 and is well known for their exterior building products. In 1989 a "super" siding company was formed when Alcoa's expertise and knowledge in the field were joined together with Mastic's experience and vast distribution network. The result was a company with a wide range of vinyl siding options that all have the high quality standards that made Alcoa an industry leader. Mastic offers siding products for just about any budget and many of them have passed some of the most rigorous testing requirements in the country--meeting approval for use in hurricane-prone Miami/Dade County. Quest. This high-end vinyl siding is a heavy, 0.046-inch gauge that should be extremely durable. It's available in three profiles and up to 35 colors. Carvedwood•44™. If you want the choice between a smooth or realistic wood finish, this may be the siding for you. Choose from six profiles and up to 23 colors with this thick .044-inch selection. Charleston Beaded. Give your home a southern look with this smooth beaded profile that's available in 14 colors. Board + Batten. If you want the look of rustic wood board and batten but not the maintenance that goes along with it, this heavy, 0.050-inch gauge vinyl siding might be just the ticket. There are 15 attractive colors to choose from. Trademark. An attractive appearance doesn't have to be expensive and this siding proves it. Three profiles and eight colors give you many options. The qualities that made siding products from Alcoa so popular are not gone--you just have to look for them in a different place.